Chris Detrick | The Salt Lake Tribune Eduardo Gavarret, of the Seventy, speaks in Spanish during the afternoon session of the 184th Semiannual General Conference of The Church of Jesus Christ of Latter-day Saints at the Conference Center in Salt Lake City Saturday October 4, 2014. The Church of Jesus Christ of Latter-day Saints | Courtesy Photo Chi Hong (Sam) Wong, of the First Quorum of the Seventy, speaks in Cantonese during the morning session of the 184th Semiannual General Conference of The Church of Jesus Christ of Latter-day Saints at the Conference Center in Salt Lake City Saturday October 4, 2014. Chris Detrick | The Salt Lake Tribune President Dieter F. Uchtdorf, second counselor in the First Presidency, speaks during the morning session of the 184th Semiannual General Conference of The Church of Jesus Christ of Latter-day Saints at the Conference Center in Salt Lake City Saturday October 4, 2014. Chris Detrick | The Salt Lake Tribune Chi Hong (Sam) Wong, of the First Quorum of the Seventy, speaks in Cantonese during the morning session of the 184th Semiannual General Conference of The Church of Jesus Christ of Latter-day Saints at the Conference Center in Salt Lake City Saturday October 4, 2014. Chris Detrick | The Salt Lake Tribune Eduardo Gavarret, of the Seventy, speaks in Spanish during the afternoon session of the 184th Semiannual General Conference of The Church of Jesus Christ of Latter-day Saints at the Conference Center in Salt Lake City Saturday October 4, 2014. 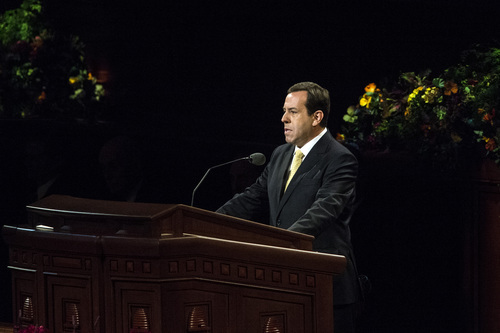 Chris Detrick | The Salt Lake Tribune Eduardo Gavarret, of the Seventy, speaks in Spanish during the afternoon session of the 184th Semiannual General Conference of The Church of Jesus Christ of Latter-day Saints at the Conference Center in Salt Lake City Saturday October 4, 2014. Chris Detrick | The Salt Lake Tribune Chi Hong (Sam) Wong, of the First Quorum of the Seventy, speaks in Cantonese during the morning session of the 184th Semiannual General Conference of The Church of Jesus Christ of Latter-day Saints at the Conference Center in Salt Lake City Saturday October 4, 2014. Strictly speaking, Chi Hong (Sam) Wong made history Saturday morning. 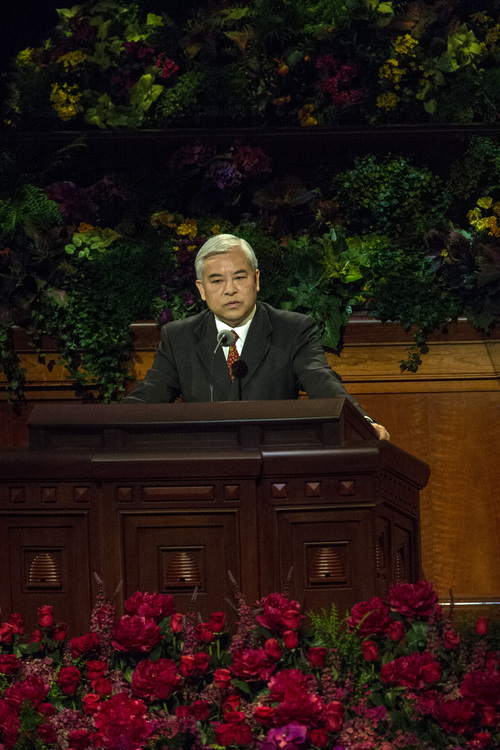 The Hong Kong native became the first Mormon leader to deliver an LDS General Conference talk in a language other than English. Wong, a member of the faith&apos;s First Quorum of the Seventy since April, spoke in Cantonese while a voice-over on the Internet broadcast translated his remarks into English. Those viewing his sermon live in downtown Salt Lake City&apos;s LDS Conference Center followed along on a giant screen with English subtitles. A number of Mormons complained on social media about the dubbing, saying they wished they, too, could have heard the Cantonese while reading subtitles. 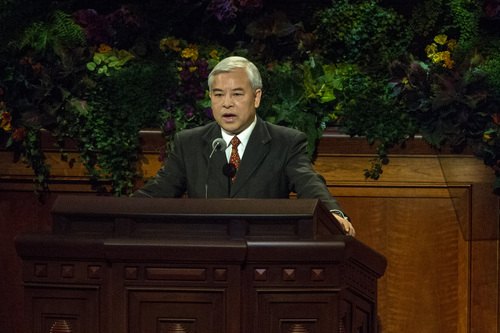 Members and missionaries must work together to "rescue" those who are suffering from "spiritual palsy," a person who cannot "come back to the church by himself or herself," said Wong, according to a provided text. "He or she could be one of our children, one of our parents, a spouse, or a friend. ... We can all help one another. We should always be anxiously engaged in seeking to rescue those in need." The 52-year-old Wong joined The Church of Jesus Christ of Latter-day Saints in 1982. He earned both a bachelor&apos;s degree in accounting and an associate degree in computer science from Brigham Young University–Hawaii, along with a master of business administration from the Open University of Hong Kong. 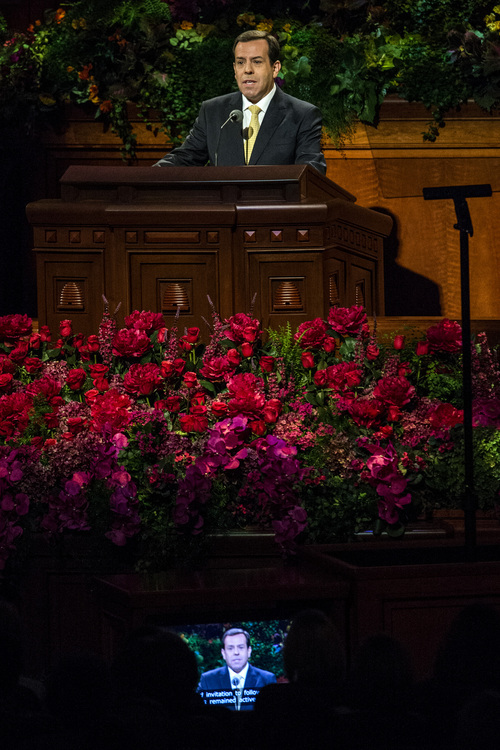 It didn&apos;t take long for another Mormon general authority to give another sermon in yet another language. On Saturday afternoon, Eduardo Gavarret, who was born in Uruguay, stepped to the pulpit and delivered in Spanish his talk about the importance of following Christ. "The invitation to &apos;come unto me,&apos; to listen to his voice, and to follow it has been the message of missionaries from the beginning, helping many to change their lives for good," Gavarret said. "Fifty years ago the missionaries entered my father&apos;s watchmaker&apos;s shop, to leave a watch to be repaired. As good missionaries do, they took advantage of the opportunity to speak with my father and mother about the gospel. My father accepted the missionaries, and my mother accepted the message and invitation to follow Christ. From that day to this, she has remained active in the church." 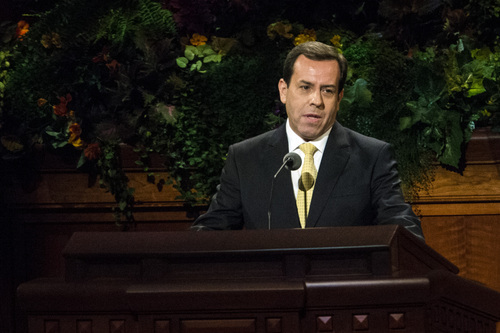 The 58-year-old member of the First Quorum of the Seventy received an MBA in marketing from INPG-MBA in Brazil, according to the LDS Church&apos;s website, and has held positions in a number of South American nations. Other Mormon authorities also could deliver their sermons this weekend in their native tongues as a witness in words of the spreading influence of the worldwide 15 million-member faith. 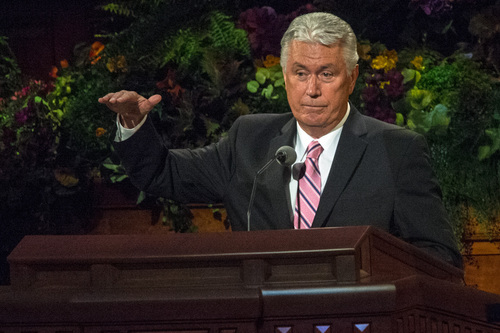 In fact, Dieter F. Uchtdorf, second counselor in the governing First Presidency and one of the most visible LDS leaders, could have given his Saturday morning speech in his native German. He said some people even asked him he was going to do so. "No," he said with a smile, "but people might think I am."